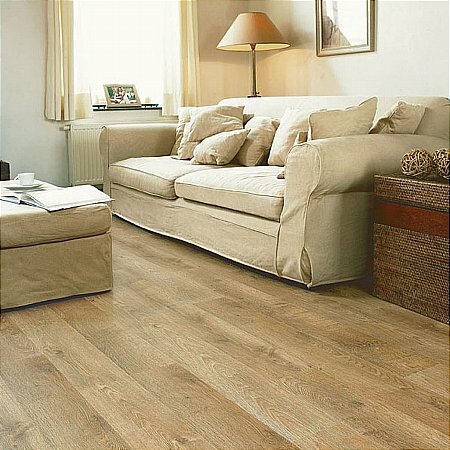 These durable and hardwearing planks feature the Quick Step Scratch Guard technology, making it incredibly resistant to all knocks, bumps and scratches. A perfect option for almost any room in the home, this is perfectly suitable for homes with children, pets or frequent parties thanks to it's strong, closed construction which prevents dirt and dust accumulating. This floor can also withstand a small amount of liquid for a short time thanks to its moisture-resistant surface and splash warranty. These attractive oiled planks are a timeless and elegant flooring solution which feature a wide colour variation for that natural look. With a thickness of 8mm, they are also available with bevelled edges if required and the easy to use Uniclic fitting system allows for a quick and easy installation. I would like more information about Eligna Old Oak Matt Oiled Planks by Quick Step.